The Data/GIS Lab is found in Room 310 on the third floor of the HIL, and although ideally suited for Data and GIS work, is not limited to these activities. The Data/GIS Lab has 2-70” display screens that can project the same screens or two-different screens as desired; however, instructors must use a laptop for presenting. The lab has 10 dual monitor workstations available, which easily accommodate 2 people as needed, and there is ample seating for researchers to work with their laptops if there is not sufficient workstation seating available for larger classes. In addition to the 10 UNBF Libraries standard desktop workstations, the Data/GIS Lab is also home to 1 Bloomberg Terminal, which requires individual accounts. Both the machine and the accounts are managed through the Faculty of Business Administration. 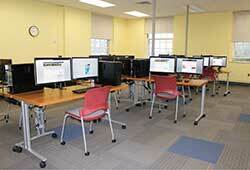 Please see the Data/GIS Lab Helpful Hints for more information.